This was a great trade! Made 100% in less than 40 minutes on March 1 $190 calls. THANKS! Regarding the 2nd 5 min candle. What do you want to see? That it opens above the trigger price or the previous candle? The opening candle is ignored(you do not trade that candle), but if the following candles take out that high/low(depending on long or short entry) after hitting the entry price, that is when you take the trade. So you are not waiting for the second candle to close, just that it is above the target entry price and above the opening candle… just making sure I get it.. I did not take the STZ trade when it gapped up the entry price (> 44.24) and then showed a red 2nd 5 min bar. 4 red bars later it is still above 44.24. Does this set up still stand? What should be the next move? Thx. Unfortunately, the stock now does not engage til above the opening candle high. Sometimes this will happen, but most of the time it will not. I’m glad I reread this section because I’ve been buying the first 5 min candle if it engaged, I thought that we only waited for the second 5 min candle if we had a gap open. Yes, that is why I gave many example. The 5 min rule is very important. What are the rules for entering the trade later in the day or past 5 or 10 minutes after the opening bell? There are no “rules” after the opening 5 minutes. You choose the trades that meet your risk profile and trading time horizon and execute the trades accordingly. I would like to make sure that I understand the 5-minute rules correctly and I have some questions. Here is how I see it. Do not trade the opening 5-minute candle even if the Trigger Price is hit. If the Trigger Price is hit during first 5 minutes, note candle’s high, which become the new Trigger Price (let’s say 53). If the second 5-minute candle opens even 1 cent higher than the high of the first 5-minute candle, the stock is engaged and I do not need to wait for the second 5-minute candle to close to place my order. Questions: What happens with the original stop? Does it stay the same or does it need to be adjusted to the higher price? If it is the latter, what are the criteria for the stop’s adjustment? Once the engagement conditions are satisfied, does it matter what happens next? In other words, what if my order did not get filled while the second 5-minute candle was opened and the stocks drops below the trigger price after that, is it still a buy? What if more than one stock engage at the same time or I missed the opening for some reason and a stock is trading higher than the Trigger Price, how much higher can it be so that it is not considered chasing if I still want to buy it? Original stop stays the same. 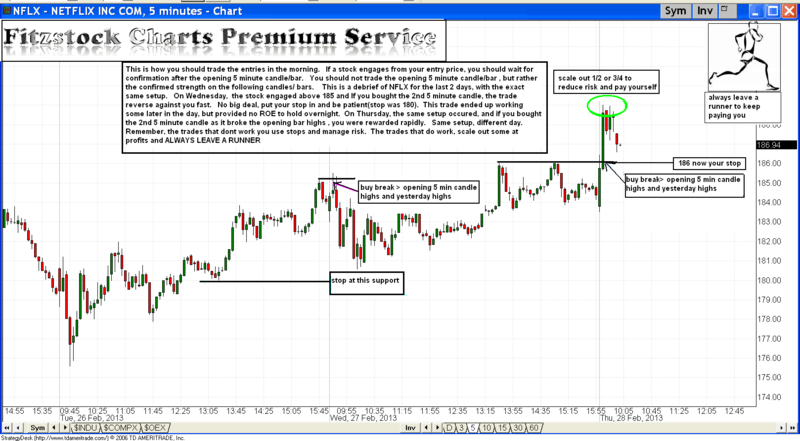 If you miss the entry, I would not take the trade if it has gone +.5%(1/2%) past the engagement price. You can NOT trade every single setup (nor need to)….Choose the ones that meet your risk profile and trading time horizon.